World Vision is well on its way toward achieving universal water access everywhere it works around the world. 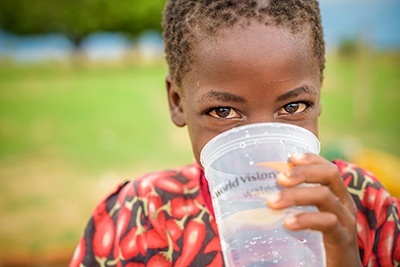 Driven by a $40 million gift to its water programs by Dana and Dave Dornsife, World Vision announced in September 2015 plans to reach one new person with clean water every 10 seconds by 2020 – eventually achieving universal water access everywhere it works by 2030. Thanks to support from its numerous partners, World Vision achieved its 2020 goal in only one year. One of the new Sustainable Development Goals adopted by United Nations General Assembly was universal and equitable access to safe water by the year 2030. Water and sanitation will influence the achievement of other Sustainable Development Goals in health, gender equality and other areas. Globally more than 660 million people do not have clean water access and nearly 1,000 children die each day because of diarrhea caused by unsafe water and poor sanitation and hygiene. World Vision is on a pace to reach an estimated 50 million people with clean water by 2030. World Vision, the largest nongovernmental provider of clean water in the developing world, employs more than 700 water professionals and partners with corporations, governments, philanthropists, churches and other partners to provide clean water access on a massive scale. A recent report by the Bridgespan Group and Forbes listed the Dornsife gift to World Vision No. 5 in its list of the top philanthropic Big Bets for Social Change. Recent research by the University of North Carolina at Chapel Hill Water Institute and Water and Sanitation for Africa found that nearly 80 percent of wells drilled by World Vision in the Greater Afram Plains region of Ghana will still operational after more than two decades. The study found that the World Vision community model of establishing water committees and charging a fee for water use were associated with the continued functionality of the water points.